The DSC Labs DX-1 FiddleHeads Focus Chart is designed for calibrating the focus on your video camera. 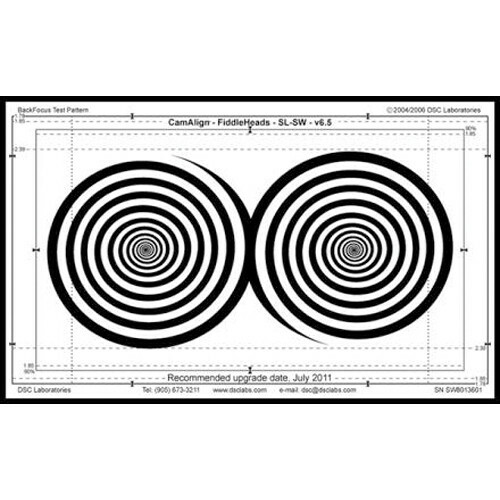 It features a spiral design and offers visual pop at the exact point of optimum focus. Featuring 16:9 (1.78) and 4:3 framing bowties, the chart also supports motion picture framing lines for 2.35, 1.85, and 90% of 1.85. You can use the DX-1 FiddleHeads Focus Chart as a precision optical signal generator that produces waveform and vectorscope displays similar to standard electronic test signals. In addition, it can be used to align multiple cameras using the chart's color patches. The chart can be used for aligning different types of lighting such as quartz, HMI, and fluorescent. It also features a maximum tolerance level of 5 CIE L*U*V units and an RMS maximum of 2 units. Box Dimensions (LxWxH) 14.0 x 9.1 x 0.9"
What are the dimensions of this chart?